We recently launched our photo-editing SDK, a mobile version of our popular web-based simple photo editor. Developers of mobile applications can now add our photo editor’s powerful functionality into any iPhone or Android app with just a few lines of code! Read on to see what Snapette did with our tools, or check out the rest of our partners to see how they’re putting our editor to use. Purveyors of arm candy and footwear aficionados with not enough closet space to spare, this one's for you. Online communities celebrating designer handbags and shoes have brought droves of the Louboutin-crazed to their websites, but Snapette is here to change the game. Download the free iPhone app now! 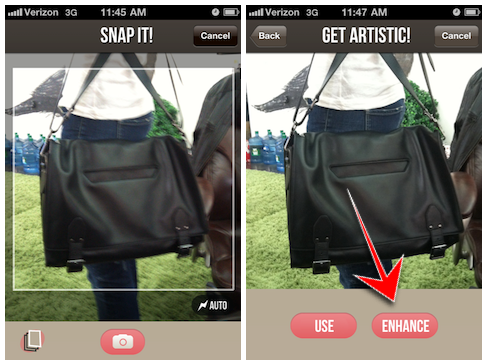 To see Aviary's mobile editor work its magic in Snapette's app, take a photo of your handbag or shoe of choice, then tap the enhance button to enter Aviary's editor. From there, you can choose to add effects or change the brightness, contrast, and saturation. All that's left to do is to add details about the brand, where you saw it, how much it cost, and a brief description! The rest of the Snapette community will be able to "ooh" and "aah" along with you, even if they're on the other side of the world. The world of mobile apps just got a little bit more fashionable, thanks to Snapette, and the Aviary team is more than happy to help. Way to keep it classy (...or edgy, or funky, or whatever your sartorial sense desires), Snapette users! We recently launched our photo-editing SDK, a mobile version of our popular web-based simple photo editor. Developers of mobile applications can now add our photo editor’s powerful functionality into any iPhone or Android app with just a few lines of code! Read on to see what Picsicle did with our tools, or check out the rest of our partners to see how they’re putting our editor to use. 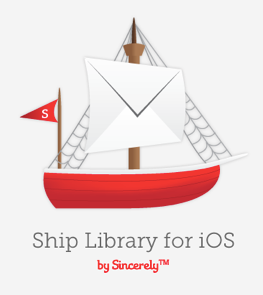 Our friends at Sincerely just launched the Sincerely Ship Library for iOS, which makes adding photo printing and postcard functionality to your app as easy as including a library. Leveraging Sincerely and Aviary's APIs, Frank Denbow -- founder of StartupThreads, organizer of StartupWeekend, and curator of StartupDigest -- has created Picsicle. The iOS app is a new way of turning your memories, in the form of mobile photos, into something tangible. In case you haven't noticed by now, Aviary loves simple, streamlined workflows. Like our mobile editor and the rest of the products in Sincerely's awesome suite, Picsicle is absolutely intuitive to use. The process is as simple as taking a photo (or uploading an existing one) and editing the image using our wide range of tools. Picsicle features Aviary's effects, stickers, text, brightness, and more, while Sincerely takes care of the printing and shipping. $1.99 is all it takes to turn the photos on your phone into a 4x6 postcard that can be shared with anyone around the world. You heard us right: Anyone! Anywhere! We're not heavy users of hyperbole, but it is literally that easy. So now you get why we're big fans, right? The ability to capture specific moments is something that the camera phone has brought to millions of people worldwide. Picsicle offers its users one more step: the ability to customize those moments in ways that are creative and unique before sharing them. Pictures can break free of being one component of an image stream, and you can enjoy the satisfaction of sharing your memories, in tangible form, with the people who will enjoy them the most. We've been waiting a long time to see Sincerely's Ship Library in action, and think Picsicle is a great way to demonstrate what the library is capable of. Aviary is proud to partner with Picsicle's efforts to bring a welcome surprise to your loved ones. Imgur, the simple image sharer, has integrated Feather, our simple image editor - could it be any more perfect?? Imgur allows you to quickly (and by quickly, I mean faster than 10 cheetahs on a spaceship) grab a link to any image to share with your friends across the internet. You can upload from the web via a URL or upload directly from your desktop. Imgur also offers the ability to merge all your images into a sweet album, and provides you with a permanent short URL, HTML links for blogs/websites, and more. They even have an awesome (and by awesome I mean AWESOME TIMES ONE THOUSAND) Chrome extension that allows for instant right-click uploads. Seriously, go install it and try it, we think you'll be quite impressed! With the integration of Feather, Imgur users will now have the ability to quick-edit their photos on the spot before sharing them. Prior to the integration, users were only able to rotate and resize. Imgur users will still be able to do those 2 things, but now they're just some out of all the options Feather has to offer! To see Feather in action on Imgur, just choose your photo and then select "Edit" before clicking "Start Upload" (don't worry, Imgur also gives you the ability to edit after you upload in case you missed it). You'll notice that crop and rotate remain on the top, giving users the ability to perform these common actions just as quickly as before. To launch Feather, click on "Advanced". You may notice that the editor looks a little different from our original design. We’ve worked together with Imgur to produce a customized skin, and it serves as an excellent example of how our editor can be customized to fit your site! We changed the color schemes to fit Imgur's brand, and we changed the buttons from eggs to circles. If you’d like to look into customizing Feather for your own site, give us a hoot! Edit as needed, and then click "Save" to advance to the final page. There you'll find the option to edit the image again if you'd like (a new feature)! We're very happy to announce our partnership with Imgur. Our goal is to create a seamless experience for Imgur users, and we believe that Feather will do just that. If you’ve integrated Feather (our Simple Image Editor) onto your site, or would like to inquire about custom stickers and skins, let us know at api@aviary.com. Our Simple Image Editor is free to use and free to implement on your site. If you’re a developer and would like to try out Feather, read the technical documentation or embed it on your site, visit our developer site to learn more. Live in NYC? Don't miss Wizard World's Big Apple Comic Con, this Saturday and Sunday, May 21st and 22nd, at the newly renovated Penn Plaza Pavilion in New York. Get tickets now! We've partnered up with Wizard World to offer attendees and everyone who reads this post a special fun effect! Wizard World will choose the most awesome photo and have it "Simpsonized" by Emmy award winning annimator, Phil Ortiz!!! Here's a sneak preview of what can be done this weekend!